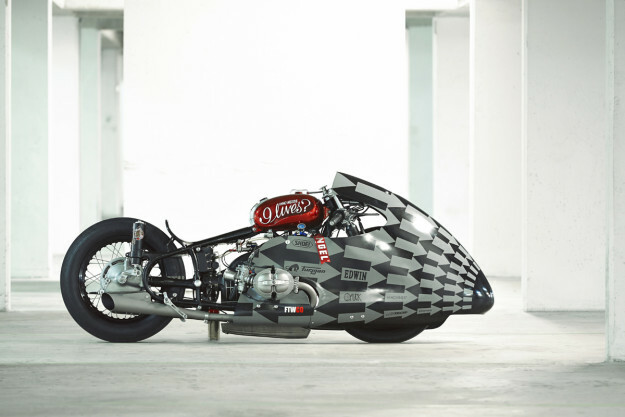 Sprintbeemer is one of the most famous custom bikes of recent years. And it goes as fast as it looks, winning the hotly contested StarrWars sprint at the 2013 Glemseck festival. Most builders would be content to sit back on their laurels after that—but not Séb Lorentz of The Lucky Cat Garage. 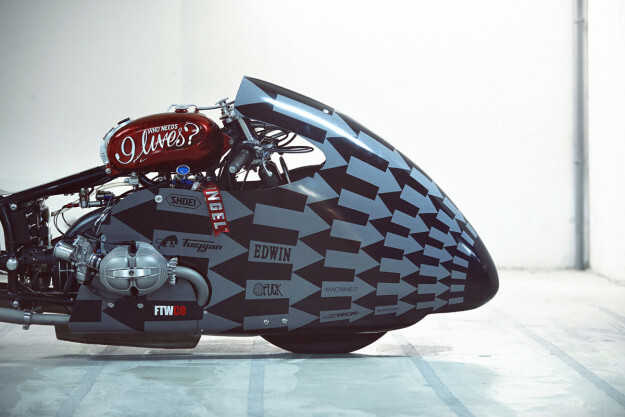 With the help of friends and sponsors Edwin, Furygan and Shoei, he decided to make the Sprintbeemer even faster—and more frightening. “To take it furtherer,” as he puts it. Existing mods to the brawny R100RS motor included bigger valves, Dell’Orto PHM 40 carbs, a 336-spec cam, a HPN ceramic clutch plate and a R100R gearbox. Now Séb called on Dirk at Edelweiss Motorsport to give it a more extensive engine tune. And we do mean extensive. 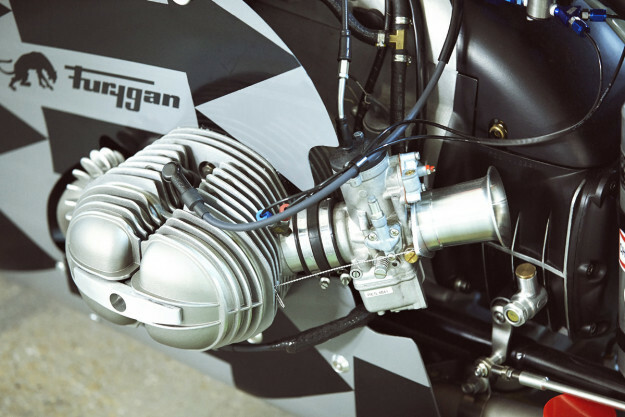 Dirk treated the boxer to race pistons, special cylinders with tuned D-shaped cylinder heads from a R100GS, bigger valves and a twin-spark conversion. There’s also a modified crankshaft, special oil pump, bespoke camshaft, lightened pushrods and upgraded rocker arms. 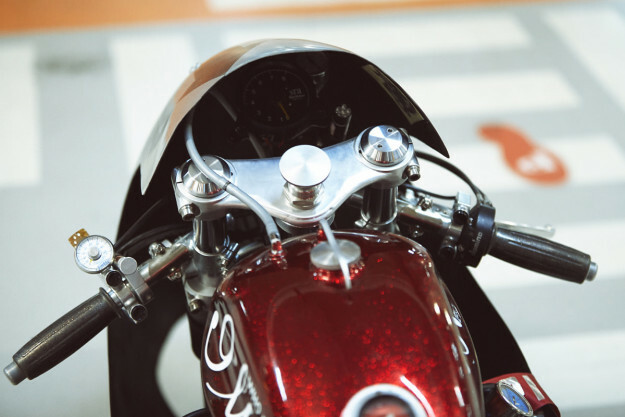 Then Edelweiss fitted a fully adjustable digital ignition system—with the rev limit set to a heady 10,000rpm. With dollars running out fast, Séb printed up a bunch of Lucky Cat Garage T-shirts and put them on sale. In no time, he’d sold enough to fund the mod at the top of his wish list: a NOS wet injection nitrous system. 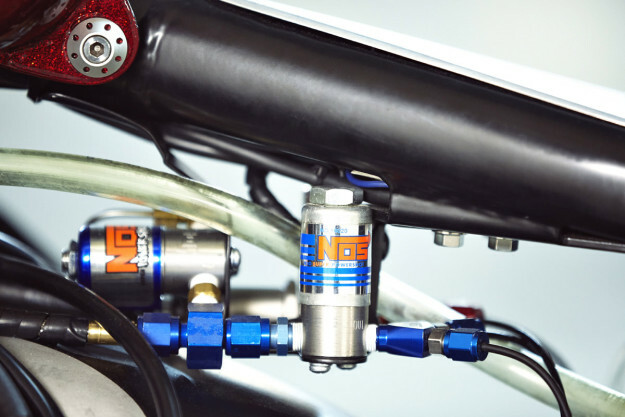 NOS systems aren’t usually installed on vintage BMWs, so the set up is completely custom. The fogger nozzles are mounted on custom-made intake manifolds, and even the fuel pump and bottle brackets are one-offs. The whole system has given the Sprintbeemer 20-25% more power. Séb then installed an electric over air shifter for quick changes, linked to two Pingel kill modules for both the engine and NOS system. He also added a MSD shift light and a purge system to adjust the NOS pressure according to temperature. To accommodate all the new components, the electrical system had to be rebuilt from scratch with separate fuses for everything. A Dynatek charging module had to be installed too, since the battery can only be charged by an external source: the BMW no longer has an alternator or charging system. 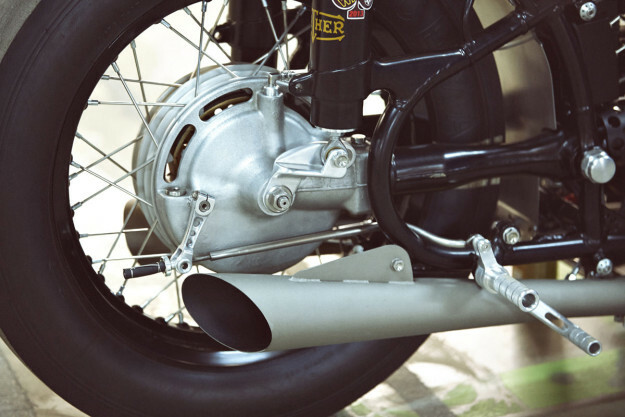 The Sprintbeemer’s ‘phase one’ mufflers were dumped in favor of a new pair, in the style of the BMW Rennsport items from the 1930s. They’ve been ceramic coated in a titanium grey finish, and inside each is a custom-built flamethrower system. Right. Some original parts remain though: like the Scitsu tachometer, Menani clip-ons, Amal grips, Domino GP throttle and the modified Mooneyes oil catch can. The seat is still a bare, aluminum pan. But the primary bodywork is all-new. 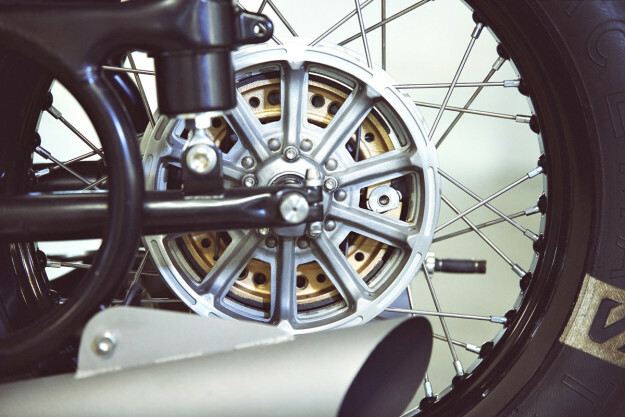 Airtech Streamlining once again supplied a fiberglass dustbin fairing—this time with the addition of two “belly wings” extending under the cylinder heads. 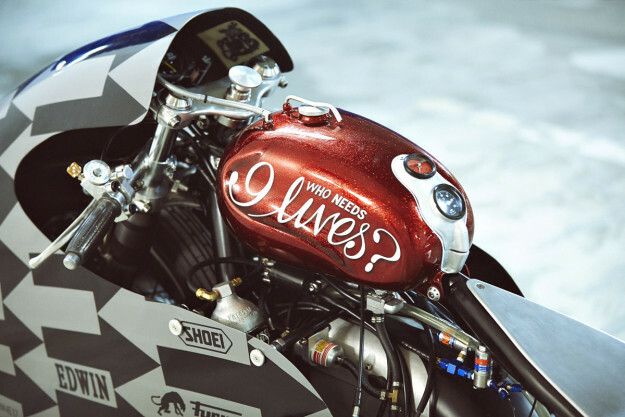 The fuel tank is from a Malagutti moped, with the oil temperature and fuel pressure gauges embedded in it, and a custom aluminum gas cap. Séb’s mods paid off. At the last edition of the Glemseck 101 he donned his leathers, boarded the Sprintbeemer and successfully defended its StarrWars sprint title. 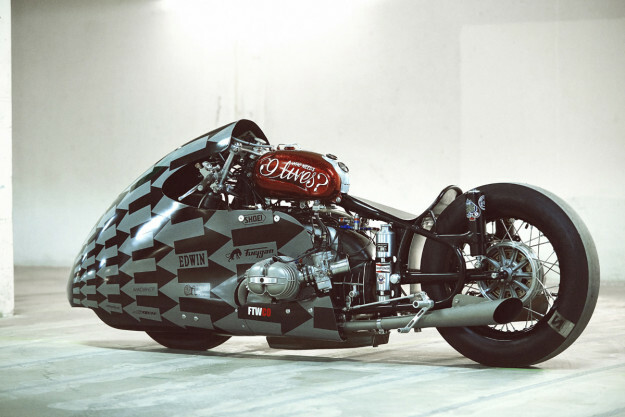 And then took gold in the BMW Motorrad BoxerSprint. 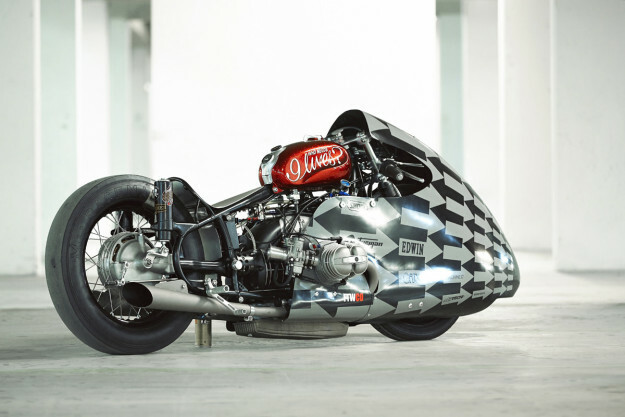 To top off a fine run of success, Sprintbeemer also took second place in the retro mod class at the AMD World Championships of Custom Bike Building. This year, Séb’s aiming for a hat trick at the Glemseck 101, as well as taking on all-comers at the Wheels & Waves and Café Racer festivals in France. Will he find time to squeeze in a few more mods before then? We’re not taking odds on that.